Our topography and soil types are totally different from Houston's. However, our residential and commercial development, much of which occurred when Houston was just a backwater, is similar in that a significant, even proportionally higher area of our land area, is covered by structures with roofs or pavement. Blanketing the earth with a covering of structures, concrete or asphalt , reduces the open land where water from rain or snow can naturally drain. In extreme weather events, water needs to go somewhere. Without land to absorb the runoff, especially if storm drains are overwhelmed, streets, basements, and as we saw with Harvey, houses can become flooded. There are improvements that can be done on individual, corporate and municipal levels to increase the absorption of water into the ground and mitigate the risk of flooding. Permeable pavers, and now permeable pavement (asphalt that can allow water to pass through) are steps in the right direction. More effective is the mitigation of runoff on-site, rather than just dumping it into a storm drain. Many towns now require the installation of structures and drywells to store and slow down the surge associated with heavy rainstorms. 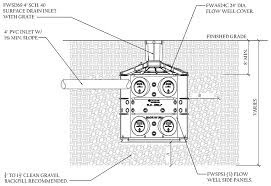 Requirements for these underground mini-reservoirs are generally triggered by permit applications for new construction or additions over a certain size. Depending on the local soil type, these structures can allow the water to "perk" into the adjacent soil. Existing structures are generally "grandfathered" in, and are not required to deal with water on-site, and as these are the majority of structures in our area, this presents a problem. In fact, many older buildings still have their downspouts and roof drains hooked directly into the city storm drains. Regulation for existing buildings and paved areas need to be enhanced and enforced in order to give the municipal drainage systems a chance to perform in a severe storm. Storm water management is not something that people think or care about normally. When it's operating properly, it is out of sight and mind. It is now much on the minds of the folks in Houston, and hopefully will prompt a movement there towards some kind of a zoning ordinance, and effective steps towards real solutions for flood prevention. Here in Eastern Massachusetts, we can all try to improve on-site management of the water that falls on our properties, and encourage our local governments to do the same. Stronger hurricanes arrive every year. It's our responsibility to be ready for them.